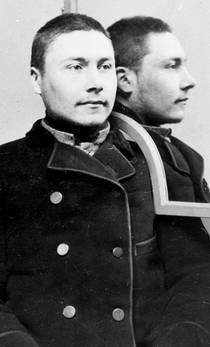 On this date in 1900, John Filip Nordlund was beheaded with Albert Dahlman‘s axe at Sweden’s Västerås County Jail. 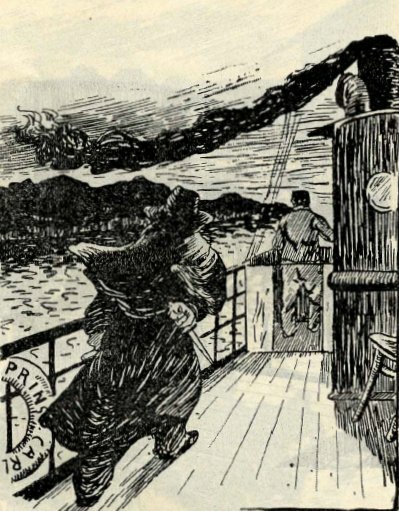 The second-last person executed in Sweden (English Wikipedia entry | Swedish) was the author of an infamously fiendish murder spree aboard a ferry steamer crossing Lake Mälaren for Stockholm on the evening of May 16, 1900: shortly after the Prins Carl‘s departure from Arboga, Nordlund, armed with two revolvers and two blades, went on a rampage through the boat (Swedish link), shooting or stabbing everyone he saw. The spree left five dead, including the ship’s captain, and several others wounded. Then Nordlund lowered a lifeboat into the water and rowed away with about 800 stolen kronor … and the opprobrium of the nation. Nordlund stalks the Prins Carl, from this verse pdf (Swedish). Police were able to track him from the descriptions of witnesses to a train station and arrest him the very next day. Their maniac would turn out to be a 25-year-old career thief, only released the month before from his latest prison stint. Although captured trying to flee, Nordlund from the first projected resignation — even relief, writing his parents that he would be well rid of a society he had never felt part of. Certainly the sentence was in little doubt given the infamy of the crime (Nordlund was almost lynched after arrest), and the man made no attempt to defend himself or mitigate his actions in court, nor to seek mercy after conviction. Nordlund was the third person executed in Sweden in 1900 alone, but there would be no more patients for Dahlman for a decade … until 1910, when Sweden conducted its first and only guillotining. The country has not carried out a death sentence since. Besides being the penultimate executee in Swedish history, John Filip Nordlund is also the last man in Europe beheaded manually (rather than with Dr. Guillotin’s device) other than in Germany.